We really love these coffee cake muffins and know you will too! They’re light, lemony, tender, bursting with blueberries and crowed with a wonderful oatmeal streusel topping and lemon drizzle. Putting all these great flavors together in one fell swoop makes these muffins truly special. Prepping is easier since we’re starting with a cake mix. The skinny on one muffin is 250 calories, 7 grams of fat and 7 Weight Watchers POINTS PLUS. One blueberry muffin from Costco has an astounding 612 calories and 32 grams of fat. 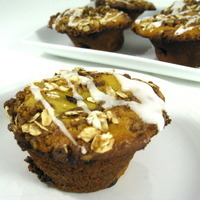 Our muffins are dangerously good and wonderful to serve for a special brunch. Preheat oven to 350 degrees. Coat a muffin pan with cooking spray with flour. In an electric mixer or large bowl using a hand mixer, add the cake mix, pudding, buttermilk, water, applesauce, canola oil and lemon juice. Mix until blended. Add the egg whites, egg, and beat until smooth. By hand, gently fold in the blueberries. Pour batter into the muffin cups. Fill each to almost the top. Spread evenly. To make streusel: In a small bowl add oats, sugar, flour, cinnamon and mix together with a fork. Gradually add melted butter and stir to coat well. Top each muffin with about 1 tablespoon streusel. Bake for 30-35 minutes until a toothpick inserted comes out clean. Remove from oven and cool for about 10 minutes. Carefully loosen each muffin with a knife and remove onto a plate. Cool before adding the drizzle. To make the drizzle: In a small dish, combine sugar, lemon juice and mix until smooth. Drizzle 1 teaspoon over the top of each muffin. Store the muffins covered on the kitchen counter for several days. They freeze great too.